EMIRATES Holidays, the tour operating arm of Emirates airline of the UAE, has partnered with Disney to bring a wide range of holiday packages to its most magical destinations in Disneyland Paris, Walt Disney World (Orlando) and Disneyland Resort (Anaheim) in the US, and Hong Kong Disneyland as well the option to go on an enchanting Disney cruise. With Emirates Holidays, guests can take an unforgettable holiday to one of the Disney Parks and Resorts, or they can take a Disney holiday as an add-on to their vacation. There is also the option to fly to Barcelona, and from there sail on a Disney Cruise Line in the Mediterranean Sea for four, seven or 12 nights. “For most children and even the young at heart, having the chance to visit a Disney Park, is a dream. At Emirates Holidays, we help make this dream come true through our renewed partnership with Disney and with our attractive offers for families,” says Dina Al Herais, vice president, commercial operations, Emirates Holidays. “With the extension of the 20th anniversary of Disneyland Paris and the return of Disney Cruise Line to the Mediterranean with sailings departing from Barcelona, our destinations offer the perfect family options to create lifetime memories. While our Disney Parks are the places where dreams come true, Disney Cruise Line offers a vacation experience unlike any other: it’s magic only Disney could provide. And now our new collaboration with Emirates Holidays further makes this dream vacation easier to realise,” says Julien Munoz, international sales and marketing executive director, Disney Destinations. The Emirates Holidays Disney packages (based on two adults and two children) start as low as Dh5,110 per adult/Dh3,070 ($1,391/ $835) per child and include return economy class airfares with Emirates, three nights’ accommodation in Disneyland Paris, airport transfers and park entrance. Additionally, there’s an option to add city excursions or stay longer. 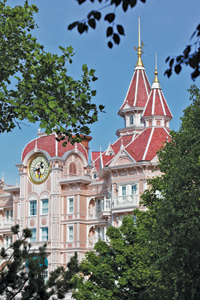 This year, Disneyland Paris extends its 20th anniversary offer for six months until September 30, 2013.